The geological time scale. Image by Jonathan R. Hendricks. This work is licensed under a Creative Commons Attribution-ShareAlike 4.0 International License. The geological time scale--shown above in a simplified form--is one of the crowning achievements of science in general and geology in particular. It is a reference and communication system for comparing rocks and fossils from throughout the world and is geology's equivalent of the periodic table of the elements. For example, a paleontologist can call her colleague and say, "I just found an awesome new trilobite from the Devonian of New York" and her colleague will immediately understand when in geological time that trilobite lived. Most of the boundaries on the geological time scale correspond to the origination or extinction of particular kinds of fossils. Knowing when major groups of fossils first appeared or went extinct is therefore incredibly useful for determining the ages of rocks in the field. For example, if you find a rock with a trilobite fossil upon it, you will immediately know that the rock is Paleozoic in age (541 Ma to 252 Ma) and not older or younger; knowing the species of trilobite allows even greater precision. This relates to a third important principle of relative age dating (see Section 2.1 for the other two): the principle of faunal succession. Faunal succession is the principle that different kinds of fossils characterize different intervals of time. This is because evolution and extinction are facts of nature. The principle of faunal succession was developed by an English surveyor named William "Strata" Smith (1769-1839). As he studied layers of rocks to determine where to build canals, he noticed that he found the same ordering of fossil species from place to place; Fossil A was always found below Fossil B, which in turn was always found below Fossil C, and so on. By documenting these sequences of fossils, Smith was able to temporally correlate rock layers (or, strata) from place to place (in other words, to establish that rock layers in two different places are equivalent in age based upon the fact that they include the same types of fossils). Temporal correlation allowed Smith to construct the first geological map (see Section 2.4) of an entire country. Temporal correlation has made many people very, very rich by allowing them to predict the locations of valuable geological resources such as fossil fuels. More generally, it has allowed us to reconstruct the geological history of Earth by comparing rocks and fossils from place to place. This is critically important because no single place on Earth preserves a complete geological history, or even a small fraction of it. The geological time scale provides a global summary of countless small-scale temporal correlations of rock layers made at local and regional scales. It is based almost entirely upon careful observations of the distributions of fossils in time and space. Because of its usefulness for communicating about events in Earth's history, it is important that all students of geology, paleontology, and evolutionary biology commit the geological time scale to memory. This is most easily done by first breaking the time scale into its component parts: eons, eras, periods, and epochs. We live during the Phanerozoic, which means "visible life." This is the interval of geological time characterized by abundant, complex fossilized remains. Being the youngest eon of time, it is also very well represented by rock at Earth's surface (because of the Principle of Superposition; see Section 1). Because of these two factors, most paleontologists and geologists study fossils and rocks from the Phanerozoic eon. 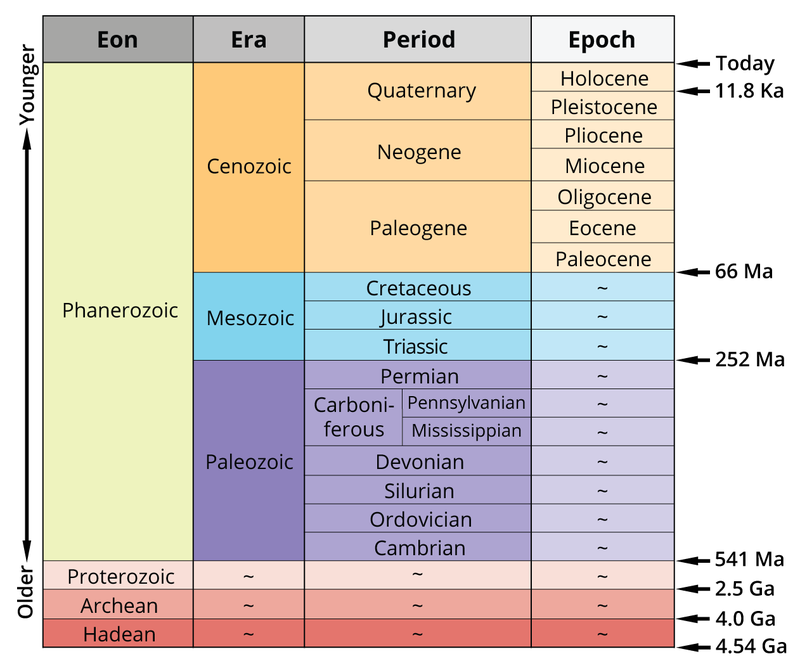 Do not let the time scale at the top of this page give you a false impression, however, about the temporal duration of the Phanerozoic eon relative to the three older Precambrian eons. Note in the figure below the absolute ages of the boundaries separating each eon of time. Left: the four eons of geological time. 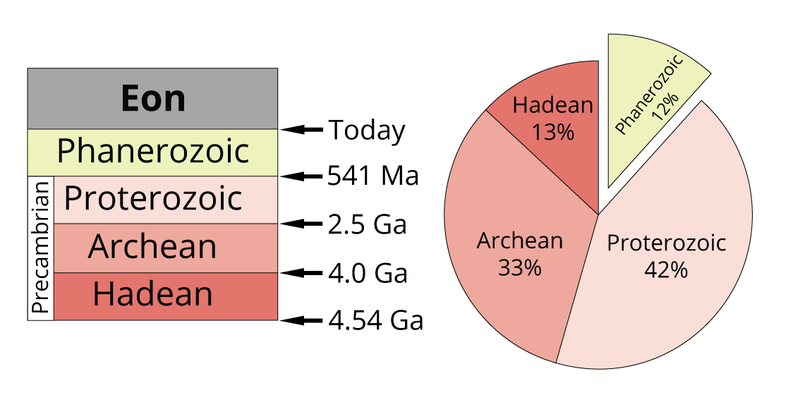 Right: the "Precambrian" eons (Hadean, Archean, and Proterozoic) represent 88% of geological time. Image by Jonathan R. Hendricks. This work is licensed under a Creative Commons Attribution-ShareAlike 4.0 International License. You have already learned that the Earth is 4.54 billion years old. The Phanerozoic eon began 541 million years ago (or, 0.541 billion years ago). Thus, the Phanerozoic eon represents a paltry 12% of Earth's history! Instead, most of Earth's history is represented by the three Precambrian eons. These older eons tell the story of Earth's beginning, life's origin, and the rise of complex life. The Hadean and Archean are difficult eons to study, however, because they are exposed in very limited places on Earth's surface. (Since they are the oldest eons, rocks that are Hadean and Archean in age are often buried far below younger rocks at Earth's surface.) Proterozoic rocks--which span nearly 2 billion years (42% of Earth's history)--are much more accessible, but, until recently, have received significantly less attention from paleontologists than rocks from the younger, fossil-rich Phanerozoic eon. That is slowly beginning to change, however, as more clues about the origins of complex life begin to be revealed from Proterozoic-aged rocks. Eons of geological time are subdivided into eras, which are the second-longest units of geological time. The Phanerozoic eon is divided into three eras: the Paleozoic, Mesozoic, and Cenozoic. 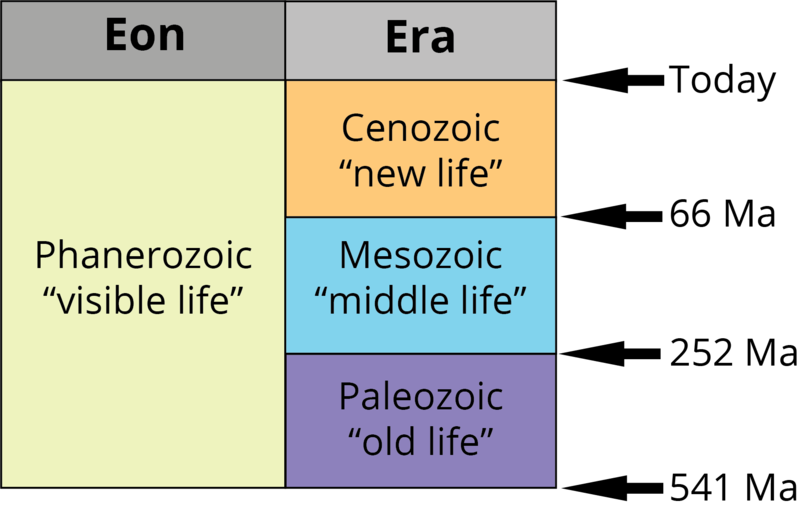 The three eras of the Phanerozoic eon. Image by Jonathan R. Hendricks. This work is licensed under a Creative Commons Attribution-ShareAlike 4.0 International License. Most of our knowledge of the fossil record comes from the three eras of the Phanerozoic eon. The Paleozoic ("old life") era is characterized by trilobites, the first four-limbed vertebrates, and the origin of land plants. The Mesozoic ("middle life") era represents the "age of dinosaurs," though also is noteworthy for the first appearances of mammals and flowering plants. Finally, the Cenozoic ("new life") era is sometimes called the "age of mammals" and is the era during which we live today. As temporal points of reference, it is worth memorizing the ages of the boundaries that separate the three eras of the Phanerozoic eon. Long before geologists knew these absolute age dates, they realized that the boundaries represent important events in the history of life: mass extinctions. For example, many fossils that are commonly found in the youngest Paleozoic rocks are not found in overlying Mesozoic rocks. Similarly, dinosaur fossils found in the youngest Mesozoic rocks are never again found in the overlying Cenozoic rocks. Paleontologists and geologists used these mass extinction events to define these (and other) boundaries within the Phanerozoic portion of the geological time scale. It is therefore no coincidence that some of the major boundaries coincide with mass extinction events! The older Archean and Proterozoic eons are similarly divided into several eras. For example, the youngest era of the Proterozoic eon is called the Neoproterozoic. For the sake of simplicity, these older eras are not included on the time scale shown at the top of this page; they do, however, exist! Just as eons are subdivided into eras, eras are subdivided into units of time called periods. The most well known of all geological periods is the Jurassic period of the Mesozoic era (the movie Jurassic Park, of course, has something to do with that). The Paleozoic era is divided into six periods. From oldest to youngest, these are the Cambrian, Ordovician, Silurian, Devonian, Carboniferous, and Permian. 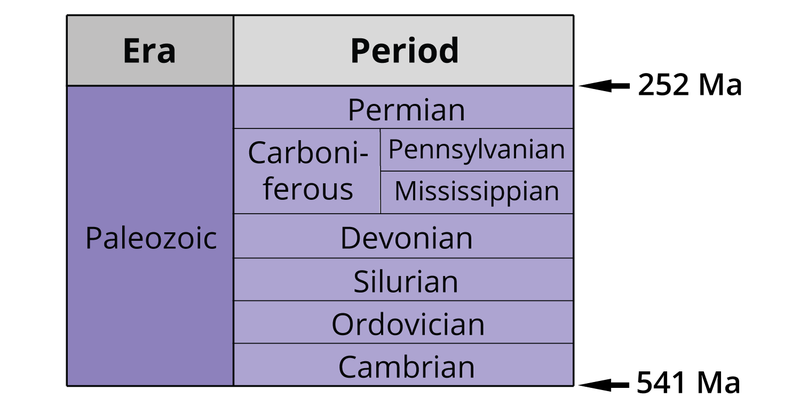 Note that in the United States, the Carboniferous is divided into two separate periods: the Mississippian and the Pennsylvanian. The seven periods of the Paleozoic era. Image by Jonathan R. Hendricks. This work is licensed under a Creative Commons Attribution-ShareAlike 4.0 International License. The Mesozoic era is divided into the Triassic, Jurassic, and Cretaceous periods. The three periods of the Mesozoic era. Image by Jonathan R. Hendricks. This work is licensed under a Creative Commons Attribution-ShareAlike 4.0 International License. Finally, the Cenozoic era is divided into three periods: the Paleogene, Neogene, and Quaternary. The three periods of the Cenozoic era. Image by Jonathan R. Hendricks. This work is licensed under a Creative Commons Attribution-ShareAlike 4.0 International License. Periods of geological time are subdivided into epochs. In turn, epochs are divided into even narrower units of time called ages. For the sake of simplicity, only the epochs of the Paleogene, Neogene, and Quaternary periods are shown on the time scale at the top of this page. It is important to note, however, that all of the periods of the Phanerozoic era are subdivided into the epochs and ages. The Paleogene period is divided into--from oldest to youngest--the Paleocene, Eocene, and Oligocene epochs. The Neogene is divided into the Miocene and Pliocene epochs. Finally, the Quaternary is divided into the Pleistocene and Holocene epochs. Some geologists now think that--since humans are having such a notable impact on the Earth and its life--a new, youngest epoch should be added to the Quaternary: the Anthropocene. There is still considerable discussion in the geological community about whether this epoch should be added, as well as debate about what characteristics should define its beginning. 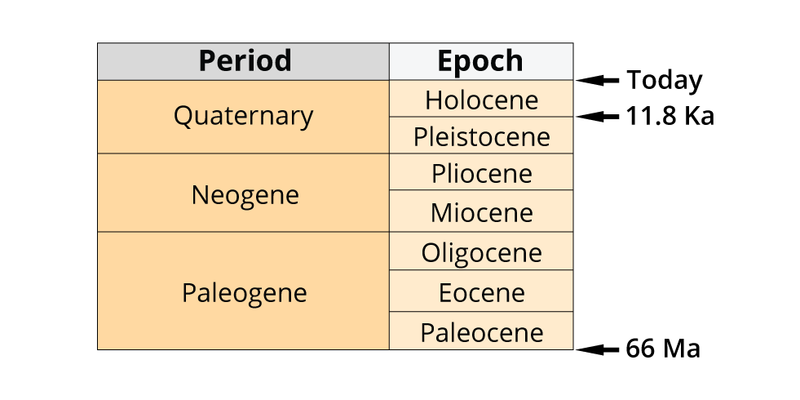 Epochs of the Paleogene, Neogene, and Quaternary periods. Image by Jonathan R. Hendricks. This work is licensed under a Creative Commons Attribution-ShareAlike 4.0 International License. Now that you have learned about the hierarchical components of the geological time scale--eons, eras, periods, and epochs--consider again how all of these parts fit together. Note that some boundaries (those that follow horizontal lines on the time scale) are equivalent in age. For example, the Mesozoic-Cenozoic boundary is equivalent to the Cretaceous-Paleogene boundary (both have an age of 66 Ma). Similarly, the Paleogene-Neogene boundary is equivalent to the Oligocene-Miocene boundary. It is much easier to memorize the time scale by first breaking it down into its component parts. Many geology students have developed clever mnemonic devices to help remember all of the names in the time scale and a quick Google search will provide many examples (which are often rather salty!) that you may find helpful as you memorize the time scale. The geological time scale is a result of hundreds of years of investigation and remains very much a work in progress. Observe the geological time scale below, which is from a college-level geology textbook published over 130 years ago by Le Conte (1885). What similarities does it share with the time scale above? What is different? 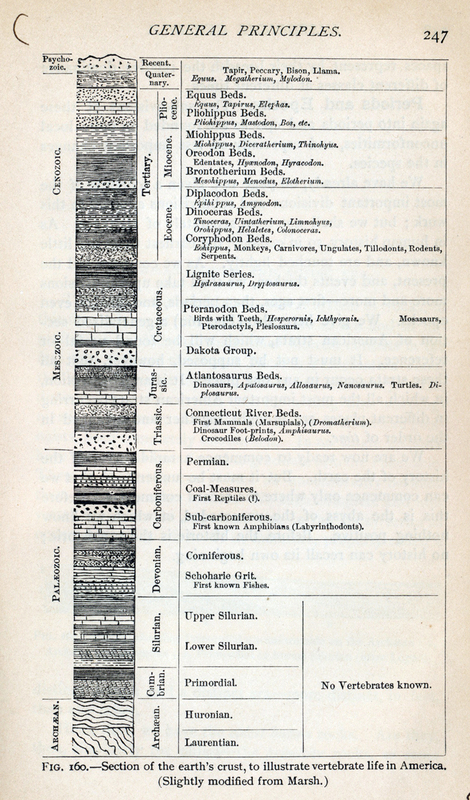 Geological time scale from Le Conte (1885) (public domain). Most of the names of time intervals on the modern geological time scale have been stable for many years. The absolute ages associated with the boundaries that separate these time intervals continue to be refined as new evidence becomes available. For example, the modern absolute age associated with the Proterozoic-Phanerozoic boundary (equivalent to the beginning of the Cambrian period) is 541 Ma. In 2009, this age was 542 Ma; in 1999, it was 543 Ma; and in 1983, it was 570 Ma. A freely downloadable copy of the most up-to-date professional version of the time scale--produced by the Geological Society of America may be downloaded <here>. Compare it with the simplified version that you have learned; you will note that it is much, much more detailed. Most geologists know the epochs and ages of the time intervals they focus on in their research, but very few geologists know the complete professional version of the time scale. Almost all geologists and paleontologists keep a copy next to their desks, however, to refer to whenever necessary. Which principle of geology states that different kinds of fossils characterize different intervals of time? True or False: The Phanerozoic eon is part of the Precambrian. Which one of the following IS NOT an eon of geological time? Hadean, Proterozoic, Archean, or Paleozoic. True or False: The Paleozoic is the oldest era of the Phanerozoic eon. Which one of the following is a period of the Mesozoic era? Permian, Neogene, Ordovician, Triassic, Mississippian. Which one of these geological time intervals is the YOUNGEST? Devonian, Archean, Pliocene, Paleogene, or Cretaceous. Which one of these geological time intervals is the OLDEST? Holocene, Paleogene, Miocene, Jurassic, Cretaceous.